The moment couldn't have been more ripe for a real advance in the fight against climate change. 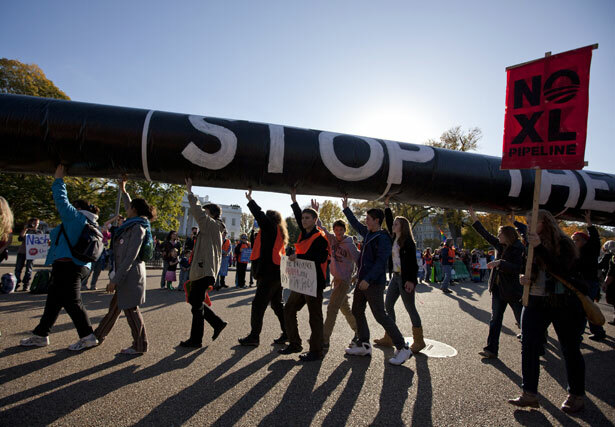 True, the administration’s November 10 statements did not outright kill the 1,700-mile pipeline, which the TransCanada company wants to build to transport highly polluting tar sands from Alberta, Canada, to refineries on the Texas coast. Yes, President Obama or his successor could try to greenlight the project in 2013, when the State Department’s new review of the project is due. But that’s unlikely, as TransCanada’s CEO, Russ Girling, has acknowledged. The project’s contracts require the pipeline to be completed by 2013, or refineries will be free to look elsewhere for supply, which Girling expects they will. In any case, such caveats mean only that the Keystone victory is not absolute. But when a $7 billion project involving the number-one US trading partner and oil supplier, a project that Secretary of State Hillary Clinton only a year ago said she was “inclined” to approve, is very publicly postponed—even as the inspector general of the State Department launches an investigation into cronyism involving a former top aide to Clinton—good luck putting that Humpty Dumpty together again. The breadth of the anti-pipeline coalition—indigenous people, progressive labor unions, youth, faith, farmer, community and environmental activists—was just one way this crusade contrasted with previous environmental campaigns. Other key differences: demands were more concrete and more radical. Strategy was set more by grassroots activists than by Beltway insiders. Tactics stressed people power—putting feet on the street, going to jail—over policy papers. The message was comprehensible to ordinary people rather than off-putting. And thanks to the Occupy movement, journalists were primed to pay attention to street protests. As with the Occupiers, establishment voices quickly registered their disapproval—and their political tone-deafness. Some, like Council on Foreign Relations fellow Michael Levi, even suggested that the delay would hurt the climate fight, because Bill McKibben and other climate organizers had muddied their message by taking advantage of the “not in my backyard” sentiments of Midwestern farmers who—oh the horror!—are Republicans. Such NIMBYism, Levi sniffed, could be used to undercut future deployment of wind farms and other clean energy sources. And not a moment too soon. One day before Obama’s announcement, the International Energy Agency released its annual report on the “World Energy Outlook.” The IEA is no den of subversives; it’s run by many of the world’s largest oil-consuming nations. Its report warns that without radical changes in the world’s energy infrastructure in the next five years, humans will make climate change irreversible. In this context the defeat of Keystone is exactly the kind of radical change, in infrastructure and activism, that’s needed. Editor’s Note: This article has been corrected to reflect Roger Toussaint’s proper title.